The second edition of the Antwerp Diamond Trade Fair will kick off on January 30 and will continue until the first of February, 2011. Following the success of the first Antwerp Diamond Trade Fair, which premiered this year in the 105-year-old Antwerp Diamond Bourse (Beurs voor Diamanthandel), the 2011 edition will expand to the adjacent trading hall of the Diamond Club of Antwerp (Diamantclub van Antwerpen) thus growing the exhibitors based from 40 to 60, allowing more Antwerp-based firms to participate in this exclusive trade show. Jean Patrick Smal, principal of the event and communications firm Punch that coordinates the fair on behalf of the city’s two leading diamond bourses said the concept of the fair had proved itself highly successful. "Once again, we are inviting high-end European jewellery firms to attend this exclusive, by-invitation only event and offer these preferred buyers to connect with the exhibiting Antwerp diamond companies who can supply their specific requirements," he said. "We’re excited to have increased the number of new participating exhibitors, especially from the ranks of the Diamantclub. 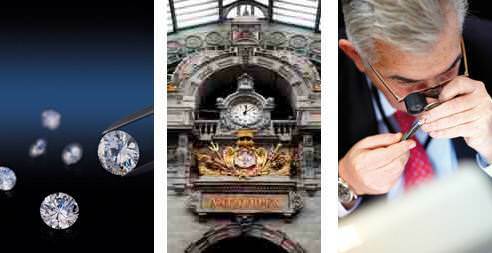 Antwerp is and remains the world’s exclusive and leading rough and polished diamond trading centre and as such is a logical venue for such a show. More than 50 percent of the world’s polished diamonds are traded in the city, and no other centre is able to provide a larger and more varied selection of polished diamonds, which are unavailable elsewhere. Antwerps diamonds are offered at competitive prices, with top notch service, shipping and delivery," Smal concluded.